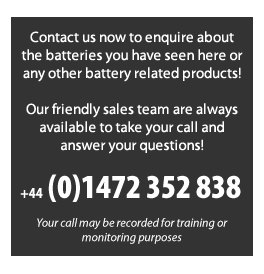 We stock the US Batteries & Trojan Battery ranges as it offers the world's leading manufacturer's of advanced deep cycle battery technology. A quality range of high powered batteries engineered with the latest technology for todays and tomorrow's leisure and marine. Rolls premium deep cycle batteries have earned a reputation of reliability and dependability in the railroad, marine, motive power and renewable energy markets. Dual container construction, high-density polyethylene materials and unique "resistox" plate design provide a life expectancy that is among the longest in the battery industry. With the highest recycling rating of any consumer product, Rolls are focused on reducing our footprint and helping customers reduce theirs. Over 75 years experience and a focus on what's to come have made the Rolls brand of batteries internationally recognized. We have a reputation for building one mean battery and you can be sure that our entire line of products go above and beyond the call of duty. With the strongest warranty in the industry, modular construction and robotically welded cells that offer the highest quality and consistency, when customers choose us, they do so with 100% confidence. Plus, all of our batteries are 97% recyclable, so you can be sure you're making the right choice for the future of your business and the planet. Established in 1935, we're proud to be one of North America's leading lead-acid battery manufacturers and the Nation's only remaining independent battery manufacturer.Located in Springhill, Nova Scotia, we produce a wide range of batteries for use in railroad, marine, motive and renewable energy applications. Relied on worldwide, our batteries are internationally recognized for their dependability and hit rate of recyclability. It's not just the outstanding quality of our batteries that we're so well-known for but also our continual advances in process, dedicated work force and unrivaledcommitmen to sustainability. The video attached below shows how Rolls batteries have helped power a school in Africa. Thanks, I placed an order on Tuesday morning and had it delivered within the hour. I'll definately be buying again. Great company, great service! Not only did I save £30 on my new Leisure battery but the advice given will help me maintain the condition of my battery ongoing saving me more money. Thanks for your help guys!! The range of batteries is incredible. The prices are the cheapest around, but the Battery Warehouse still deliver great quality products. Have a question about our products? Call our sales team! Our main objective is customer satisfaction. The more impressed you are with our products and services, the more likely you will be to return and recommend us to your friends and colleagues. We offer a great delivery service on all orders and if you place your order before 3pm Monday - Friday, your order will be packed and dispatched the same day. © 2019 Battery Warehouse. All Rights Reserved.